Posts about reducing waste, Agile and Lean Methodologies. I learned about the Agile Buffet Rule from the ever loquacious @jpacklick. This is not to be confused with the Warren Buffett Rule or even the Jimmy Buffett Rule. The concept, as it applies to Agile, is simple: Take as many stories as you want from the backlog, but make sure you have the available capacity to complete the work you take. I’ve noticed a trend at some companies where teams are not completing all of the work they have committed to, but calling the sprint successful. Often they are close to completing all their work; however I was taught to finish everything on my plate. Maybe it was the way I was taught Scrum in the old days, but I still feel if you don’t complete all the work you commit to, your sprint was not successful. It is very empowering for a team to be able to use velocity and capacity to plan their work, and have the costumer’s confidence that you will be able to finish what was committed. For Agile to be successful, you need to to win the trust of the business. You do that by delivering what you promise. It should be uncommon when you don’t finish all the work you signed up for. To be clear, I don’t have any problem with teams adding stretch goals to the sprint, so long as everyone understands they are stretch goals, and not part of the sprint commitment. You have a ten pound sack of potatoes and that’s all that will fit. Don’t try to put fifteen pounds in a ten pound sack. When I’ve observed teams committing to more work than they have in the past, the common question I ask is: what is different about this sprint versus the last one? In other words, what has changed since the last sprint that enables you to commit to a higher velocity? So that begs the question: how do we ensure that we complete all the work we commit too? We can break the answer into two parts: Planning and Executing the Sprint. The obvious answers are to make sure you are not going over your velocity or capacity thresholds (velocity in points and capacity in ideal hours). Your velocity is an average of your points over time (sprints), which should be relatively stable. So do not take more story points than your velocity. Likewise, if you are doing your planning via WIP, Cycle Time, etc. the same rule applies: Don’t take more than your WIP allows, unless something has changed. Number of days in the sprint: This is the total number of days, less any holidays, training, conferences, vacation days, etc. Number of ideal hours per day: This is the amount of hands-to-keyboard-time you actually do on project work each day. It could be based on an 8 hour work day, less meetings, breaks, lunch, phone calls, responding to emails, etc. I’ve seen teams use as little as 2 and as high as 6. Never more than 8 unless they plan to work 12 hours days. To give you some relevant data, from a study we did at Nokia, the average team only spends a 1/3 of their day on actual project work. % dedicated: It’s unfortunate, but many organizations continue to loan team members across teams. As a result, you may have team members dedicated less than 100% to the team. Thus, you must adjust their capacity accordingly. I don’t condone this, but it is reality. For those that are interested in why this is a bad idea, you can find it here in Kenny Rubin’s most excellent presentation on Economically Sensible Scrum. Remove impediments – This strategy should be obvious, and hopefully, is being done on a daily basis. Swarm – Can we gang up on unfinished work? Add people/experts – perhaps we are struggling with a difficult story and the expertise exists outside of the team. With this strategy, you are essentially trying to increase your velocity. Move the stories to different owners – It could be that the person working on the story, isn’t the best one suited for the work. Work overtime – Not ideal, but can work as long as it doesn’t happen very often. Move into a team/war room – Sometime getting together in a crisis can help bring ideas out faster. Out of ideas? – Ask for help. This is not the time to be shy. Ask the team, ask your manager, ask your coach, the Internet, etc. The key of course, to making use of these (or other) strategies, is early detection. None of these will work if you procrastinate. There is a common misconception in Agile that we don’t do much planning. Agile is supposed to be all about cowboy coding and flying by the seat of your pants, or so I keep hearing. Rubbish! Those of us that have been practicing Agile for a number of years, know that nothing could be further from the truth. We know that it is a myth to believe that Agile methodologies cannot operate in a hard date-driven environment. We know that having a plan, is incredibly helpful when trying to manage risks and dependencies. We also know, understand, and embrace that these plans are subject to change. However one of the most difficult aspects of Agile (or any other) project planning, is managing risks and external dependencies. These issues can cause delays and expensive interruptions in your project. 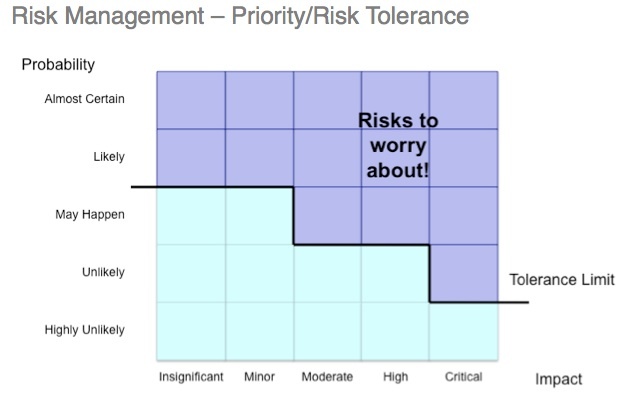 In this post, I am going to focus on a few methods I’ve used to help plan and manage risks and dependencies in an Agile project. The Roadmap (or Delivery Plan) is an artifact, which deconstructs the Vision into a long-range plan by releases. This is usually created during Sprint 0 (or project start) and updated, at a minimum, at Release Planning. Ideally it is updated at the end of each Sprint. The Roadmap consists of themes and/or high-level stories (epics). The objective is to figure out, at a Release level, when these stories are being delivered or when they need to be delivered. Part of the exercise of building the Roadmap involves identifying and evaluating risks, as well as dependencies during upcoming releases. See the example artifact below. 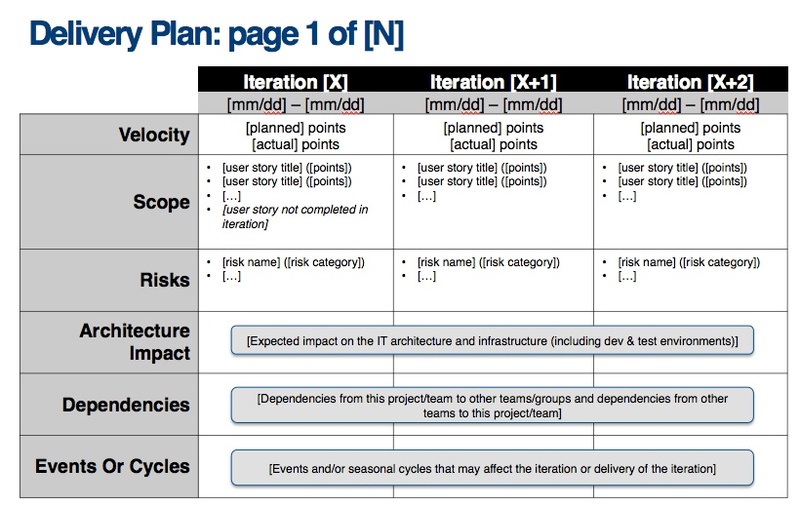 The Release Plan is an artifact, which deconstructs the Roadmap into a high-level plan for each release, by Iterations. You only need to capture the high-level stories at this point. However, if you have a groomed backlog and know your team’s velocity, you can replace the epics or themes with actual stories and list the velocity per sprint. It is a quick information radiator to determine if you will be able to meet your sprint and release goals. You place the risks and dependencies you identified in the Roadmap into the Iterations you expect them to occur (if known). This gives the team a sufficient amount of time to prepare for upcoming risks and external dependencies. Generally, due to all the changes that occur during a Release, you only need to plan out enough Sprints to satisfy a single Release. 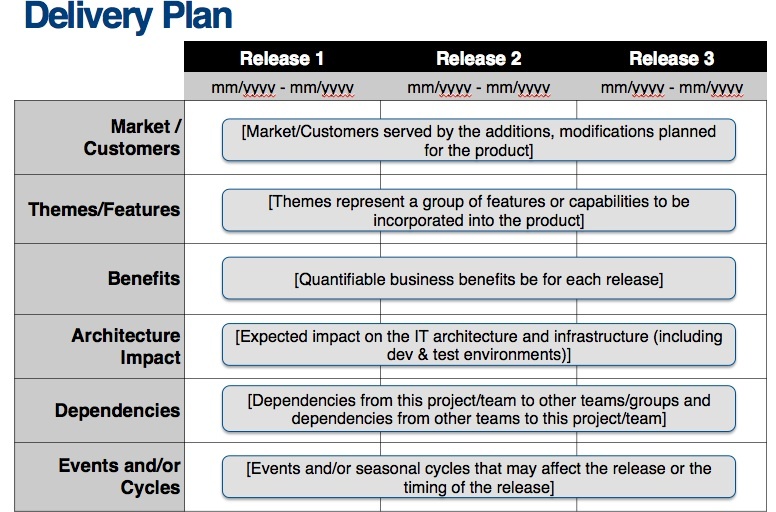 The release plan is also created at Sprint 0, updated at the end of each sprint, and created at each release planning session. Thus far I’ve described planning and managing dependencies and risks at the Release level. At the Sprint level, managing external dependencies and risks is relatively straightforward. If you understand the risk, and it is both impactful and probable, you can often write stories to take action to mitigate the risk. Obviously you don’t want to write a story for every risk, so only pick the ones that are likely to happen and have a impact and probability greater than 3. So, you wouldn’t want to write a story to deal with a potential meteor strike, however you may want to put a story in the backlog to deal with a risky architecture issue. As a Systems Engineer, I want to get a performance report from Vendors A,B, and C, so that I can determine if their software’s UI response time will meet our .5 second threshold. You will identify whom you have the dependency on (Get From) or who has the dependency on you (Give To). There is a specific date of when you expect to receive or give the dependency resolution. This is used to give you plenty of time to prepare for the delivery (or if necessary, delay). There is a clear description of the dependency and the expected resolution (Acceptance Criteria). You NEVER write a Give To/Get From story for your own team (internal dependencies). Since you can control that work, the scheduling of the story and any potential impacts will be handled by the Product Owner and Scrum team. It is important to understand that the previous items are simply describing tools, processes and artifacts. They are NOT replacements for the values of Agile, the first of which is: We value individuals and iterations over process and tools. In conclusion, don’t use these processes and artifacts as an excuse to not have a conversation about risks and external dependencies. Instead, use these tools, processes and artifacts to enhance the conversations you are already having . I’m always interested in hearing about Agile projects that have failed. So, what do I mean by fail? An overly simplistic answer might be, failing to deliver on release commitments. In other words, customers and stakeholders have an expectation of your team to deliver X, and you end up delivering Y. Not simply a scope change, but something completely different than what was expected. Or perhaps there is a definitive release date and the team fails to meet it. I have encountered many reasons for Agile project failure: lack of people, lack of commitment, unexpected risks, failure to manage dependencies, etc. Arguably however, the most egregious is the failure to embrace the organizational and culture changes of the Agile Manifesto and principles. Many companies believe that simply doing the mechanics of an Agile methodology, such as Scrum (e.g. daily planning, demos, retrospectives, sprint planning, etc.) is all that is needed to be Agile. I submit that doing the mechanics of Scrum, doesn’t make your project Agile. What makes a project Agile is adherence to the principles and values of the Agile Manifesto. COO: You suggested we try using Scrum, however we’ve tried it before and it didn’t work for us. Me: That’s unfortunate but interesting, I’d like to hear more. What happened? COO: Well, one of our teams read some books on it, then tried to implement it for a couple of days. During that time, we didn’t observe any improvement, meanwhile the rest of the project fell behind. I wish I could say that the last sentence was the punchline to a joke, but as mentioned previously, it is a true story. More commonly, when I hear about Agile projects that have failed, the methodology being used (FDD, Scrum, Kanban, etc.) is blamed for causing projects to fail; when in reality, the Agile methodology being used is merely exposing existing problems. Thus Agile is blamed for project failure due to the problems it caused. As a coach, I try to set the expectations that Agile is similar to a spotlight: it is going to expose problems you didn’t even know you had. In addition, simply using an Agile methodology won’t solve your problems. True, Agile methodologies will give you some tools to help you solve the problems (e.g. retrospectives), however you won’t get the benefits of Agile unless you take action and solve the issues that have been exposed. What did you work on yesterday? What is impeding your work? What did you get done yesterday? What will you get done today? What is preventing you from getting work done? In other words, the focus should be on completing work, not just doing work. It is a somewhat subtle yet important point, that has other ramifications on how we do Scrum: We need to be breaking tasks down into small enough chunks to get accomplished in a day. If our goal is to complete user stories and get them accepted every two-three days, then tasks should be one day or less in length (in ideal time). It also means if tasks (or work) are not getting completed on a daily basis, we may have hidden impediments. What’s a Product Owner To Do? CSM, CSP, SPC Based in Orlando, Florida; Joe Vallone is the owner of Agile Business Connection LLC. Joe has been working in Scrum and XP environments since 2002. He is a Certified Scrum Master, Certified Scrum Professional, SAFe Program Consultant, and has has helped several large and small companies make their transition to Agile methodologies. He has an Engineering undergraduate degree from the University of South Florida, and an MBA Southern Methodist University's Cox School of Business.